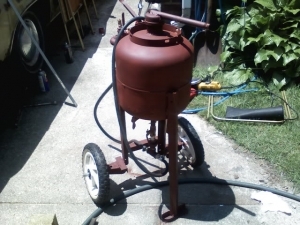 Homemade sand blaster constructed from scrap materials. Pressure vessel was adapted from a propane tank and fitted with a 125 PSI relief valve. I read the thread on this, along with many comments. It seems that an old propane tank might not be the best tank for the job, according to those who are supposed to be in the know about such things. However, I think that if the actual pressure in the tank is kept very low - just enough to ensure delivery of the media - and the pickup air line below is maintained in good condition, this should work a treat. I'm thinking that a pressure hot water tank for domestic use would be stronger, and perhaps carry more blasting media for those bigger jobs. This could be run as a siphon unit, the siphon being gravity fed from above. That should eliminate any potential danger from explosion. I think it's a great idea.